It’s good to be passionate about the activities we engage in. I love cooking, for example, and swimming and traveling and being a writer and broadcaster. What are you passionate about? What gives you enjoyment and enthusiasm and motivation? One man who is synonymous with passion is Jimmy Buffett. He thinks of himself as a troubadour in the old sense of the storytellers and entertainers. Margaritaville, Come Monday, Cheeseburger in Paradise, Changes in Latitudes, Changes in Attitudes. Typically, Jimmy is more interested in writing, recording and touring than in being a celeb. Unaware of the success of his first Top 30 single back in the ´70’s, Jimmy shared that, "I was in Europe working on a film production when I heard "Come Monday, being played in the London Airport. I figured something was happening, and called home to find out we were on the charts." But it was Margaritaville that made him a household name. It was a 5-minute song! On his way back from Austin, TX, he ran into an overabundance of tourists attacking Key West. So he took it all in and wrote the song. We all know the rest of that story! Jimmy Buffett has a huge heart and is a good soul. He loves to perform, to write and to make a difference. He has written three No. 1 best-sellers. Tales from Margaritaville and Where Is Joe Merchant? His book A Pirate Looks At Fifty went straight to No. 1 on the New York Times Best-Seller non-fiction list, making him one of eight authors in that list´s history to have reached No. 1 on both the fiction and non-fiction lists. Buffett has used his fame and notoriety for numerous commercial endeavors. He owns or licenses the Margaritaville Cafe and Cheeseburger in Paradise restaurant chains. He opened the Margaritaville store in Key West, FL, in 1985. In 2006, Buffett launched a cooperative project with the Anheuser-Busch brewing company to produce his own beer under the Margaritaville Brewing label called Land Shark Lager. That has expanded to include cocktails and Margaritaville Food Direct. His capitalizing is well executed and thank goodness his philanthropic and charitable endeavors are also prolific. This month we are inviting you to become passionate about making a difference and to care about a cause that is close to home. Save the Manatee Club is a nonprofit organization established by Jimmy Buffett in 1981. Their mission is to protect endangered manatees and their aquatic habitats for future generations. Manatees can be found in shallow, slow-moving rivers, estuaries, saltwater bays, canals, and coastal areas — particularly where seagrass beds or freshwater vegetation flourish. Within the United States, they are concentrated in Florida in the winter, so now is the time to be extra cautious if you are boating. Patrick Rose, aquatic biologist and Executive Director of the Save the Manatee Club, expresses concern that manatees continue to face tremendous challenges to their survival. “Each year, many of these gentle aquatic mammals are injured or killed by human activity, especially from being struck by boats and other watercraft,” he explained. “Its habitat is threatened by Florida’s growing human population, which places increasing pressures on the waterways where they live. This holiday season, you can adopt a real manatee and help protect an endangered species at the same time. Funds from the Club’s Adopt-A-Manatee program help protect manatees and their habitat. Unlike other animal adoption programs, the manatees are real, living manatees with known histories. You even have the opportunity of seeing your adopted manatee at one of three locations in Florida. Adoptions help fund rescues of injured manatees and orphaned calves, as well as investments in scientific research, public awareness projects, and conservation programs in America and around the world. Manatees are listed as endangered at the state, federal, and international levels, so let’s all value the great gifts that nature provides, have fun this Thanksgiving with those you love and share stories that you are passionate about!!! . • An adoption certificate, full-color photo, and biography of a real endangered Florida manatee. • The Manatee Zone, our official Club newsletter, featuring updates on the adopted manatees. • Paddle Tales, our e-newsletter (when an email address is provided). • FREE SHIPPING for U.S. adoption orders. 1) The manatee´s closest relatives are the elephant and the hyrax (a small, gopher-sized mammal). 2) Manatees are believed to have evolved from a wading, planteating animal. 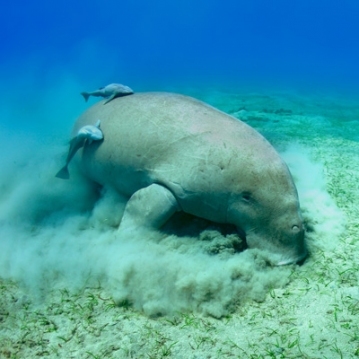 3) The average adult manatee is about 10 feet long and weighs between 800 and 1,200 pounds. 4) Because they are mammals, they must surface to breathe air. They may rest submerged at the bottom or just below the surface of the water, coming up to breathe on an average of every three to five minutes. Manatees usually swim about three to five miles per hour.